French cars, love them or hate them, are very rarely boring. Renaults, even when they’re designed to be utilitarian or cheap, somehow manage to have a certain interesting flair: look at the Renault 4 or Dauphine or Twingo: all cheap, basic cars, all somehow charming in their own way. Not so with the Renault Alliance, the successful experiment to see if you could make a Renault really boring. What makes the Renault Alliance even more fascin-meh-ting is the fact that the car has an interesting origin story. The cars started life in France as the Renault 9 (the hatchback version was the Renault 11, which was called the Encore here), and the only reason the Alliance version exists at all is because in the 1970s, America’s number four carmaker, AMC, was about to die. AMC had only 2% of the U.S. car market, and when the economy declined in the late ‘70s, no banks were interested in helping out AMC. 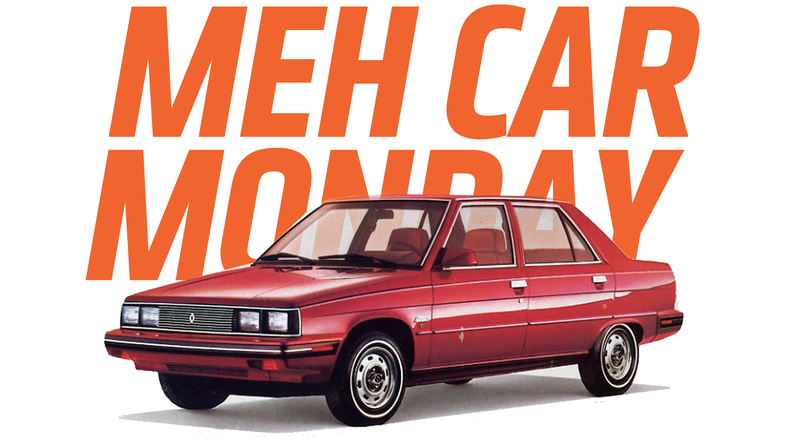 The government was game to co-sign loans for Chrysler, but, again, nobody really cared all that much—save for fanatical Pacer and Gremlin owners—if AMC bit the dust. So, desperate, AMC reached out across the pond, and worked a deal with Renault to get a $90 million loan, and then exchanged what eventually would be a controlling share of ownership in AMC for the right to sell Renault models in America. This actually seemed like a great idea: for Renault, it was a chance to finally crack the U.S. market. They had a good start in the ‘50s and ‘60s with the Dauphine, which for a while was selling as the number two import, right after the Volkswagen Beetle, but Renault never built a dealer network in the U.S. like VW did, which effectively killed them. AMC’s dealer network was a chance to make things right. From AMC’s perspective, they got to, you know, stay alive, and they got access to small, fuel-efficient cars that they could not build, but people wanted. They offered the Renault 5 as the LeCar, but even that was a bit too weird for most weird-phobic Americans. That may be why when they decided to “Americanize” the Renault 9, they went so all-out on the dullification front. The car used the same 1.4-liter engine as the LeCar, making a limp 64 horsepower—later versions got 1.7-liter and then 2-liter engines that made up to 95 hp (in the more-fun GTA version), which helped a bit. Still, the car itself was about as generic and bland an ‘80s FWD sedan could be. The Alliance’s styling was clean, crisp, hard-edged, and just about completely anonymous. Those looks of stunned amazement you see there are the only recorded case of anyone having that reaction to a Renault Alliance. The Alliance and the hatchback version, the Encore (which did at least have a sort-of-cool glass bubble rear hatch) were built in America, and were certainly priced competitively, at $5,595. A Honda Civic from that era would have been right under $6,000. Those effects are pretty fantastic, though. Were those all analog back in the day? I mean, sure, I get that does make for a better ride, but that’s a tricky thing to get people excited about. When the AMC sales guy takes you by the arm and asks you to look, I mean really look at the position of those back wheels, that’s probably not going to get you reaching for your checkbook. Really, the car was fairly decent, delivering good fuel economy and arguably handling better than cars like the Citation or anything AMC could have offered otherwise, but that’s just all part of why it’s such an ideal meh car: if it was really terrible, that’d be too interesting. The combination of fierce adequacy, looks so boring your brain just substitutes a white box with the word CAR on it when you look directly at it, and a not-so-stellar reliability record meant that the Alliance wasn’t the runaway success AMC hoped. The car did have a role in helping to keep AMC going a bit longer, so, in that sense, I’m happy the Alliance existed. I guess that’s enough.